Start or Join an Action IRL! Come out to boldly expose fake clinics! You bring the party. And check out this awesome toolkit from ReproAction too! STEP 1: read here first. Who is funding the fake clinics in your state? Have there been any efforts to regulate fake clinics in your state or at the local level? What impact are fake clinics having on local abortion providers and patients? Discuss with those most impacted and create a clear demand or set of demands (and targets!) to be at the center of your action. If a fake clinic in your community is located near an actual clinic, the real clinic will very likely NOT be comfortable with your having a protest of any kind while their patients are coming in for appointments. Reach out to them to let them know you want to do a fun action to expose the fake clinic next door, and see if you can find both a time, a location, and a strategy that works best for everyone—check out ideas for alternative locations below! 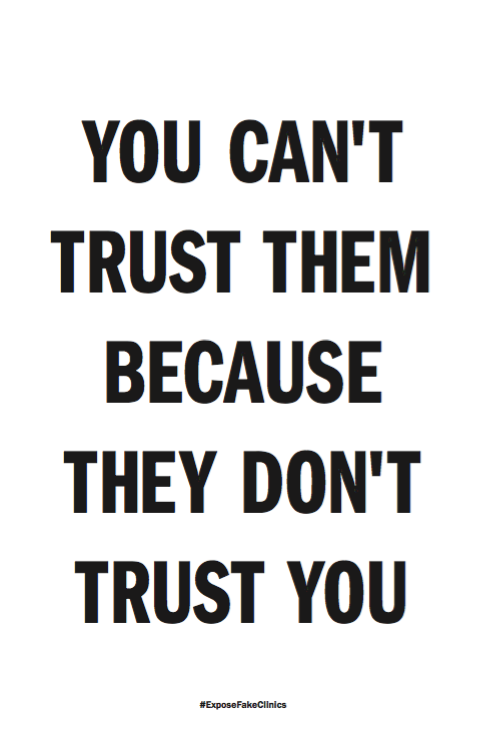 If you are going to be near fake clinics, DO NOT ENGAGE with their staff or visitors. Remain peaceful, remain on public property, and follow the handy tips below! Local fake clinic not co-located with a clinic? Show on up! 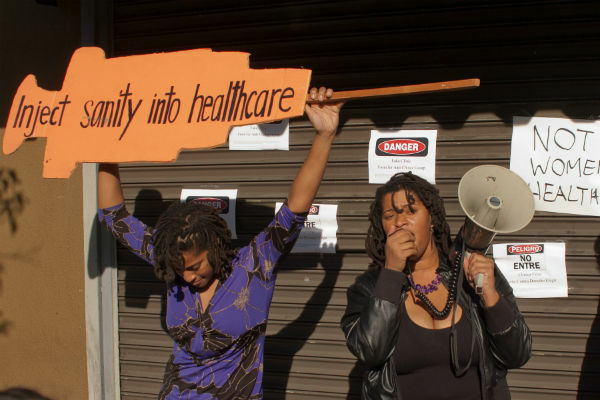 Get inspired by this action outside of a fake clinic from ReproAction and this one from Lady Parts Justice League. Signs, chants, + more ideas for actions below! From Rewire: Pamela Merritt of of ReproAction leads a protest at a fake clinic in St. Louis in June to launch of the Show Me Accountability campaign, in which Missouri activists are leading direct actions to hold members of the Senate Interim Committee on the Sanctity of Life accountable. If your local fake clinic is too close to a real health provider to do an action there, that doesn't mean you can't hit the streets! Do you live in one of the thirty-four states that spends taxpayer $$$ on fake clinics? Is your governor a big fan of funding these creeps? Find out what legislator authored & championed the bill to fund fake clinics in your state and set up a sidewalk protest in front of their offices! 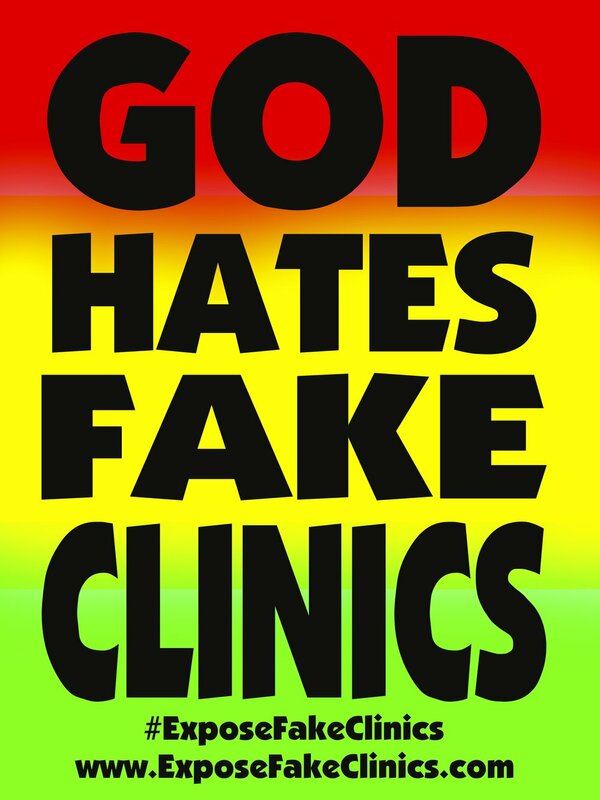 Or is your local fake clinic directly affiliated with a local church? Hold an action outside before a service and ask parishioners heading in if they know that their church promotes deceiving pregnant women. Get it covered: The more visually engaging, the more the media will want to cover your action! Call + tweet at local reporters in your area to let them know when and where you'll be! And take lots of pictures in case they can't make it — write up recap and send it to them to write about! Even better, take video or do a Facebook Live right from your action! And write your own op-ed for local media to let folks in your town know what's happening (check out this awesome one from ReproAction). Download + print any of the 11x17 signs from Shout Your Abortion (above) these cheeky 18x24 signs from Lady Parts Justice League (right) if they fit with your action, or make your own! Some more ideas listed below. Make sure to put the ExposeFakeClinics.com website and #ExposeFakeClinics hashtag so folks who see it can find out more! Ask me about my abortion! Abortion Leads to... breast cancer [crossed out] / infertility [crossed out] / Not being pregnant. To this tune: Real doctors provide us care, you just lie and shame and scare / Sound off—get facts! / Sound on—not quacks / Expose fake clinics — dot com! Fake clinics will lie outright / this is why we stand and fight! Fake clinics Force you to breed / regardless of the care you need! Expose fake clinics — no joke! / Get informed — stay woke! No more stigma, no more blame, fake clinics specialize in shame! Fake clinics are lying sacks / cause fake clinics give zero facts! Make sure your clinic isn't fake / when you see the condom break! Fake clinics will not help out if –bortion is the choice you shout! To this tune: Expose fake clinics / dot com! No Facts Given! No Facts Given! No Lies Between The Thighs! Have you or someone you know had an experience with a fake clinic? Share it out loud at your action! Invite a speaker from your local abortion provider to share about the impact the fake clinic is having on their work. How are fake clinics funded in your state? Any good ideas for what that money should be going to? Any active campaigns happening that should get a shout out? Shout em out! If you're out in public, people will be walking by your action and wondering what's going on! 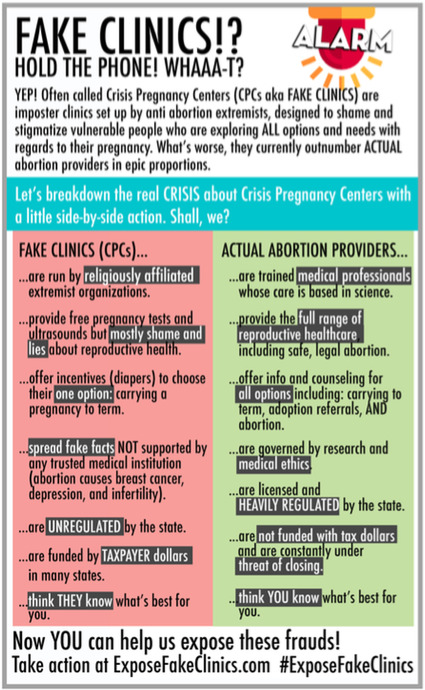 Let them know what's up in their community: download this 1/2 page flyer (left) about fake clinics, or you can just grab parts of it to make it your own. Flyers are also good to share when you're tabling and doing other kinds of community events where you wanna educate folks! STEP 3: Tell the World! Share your event link on social media. Be sure to tag #ExposeFakeClinics! Need people to come out? People are itching for fun activism - reach out to local groups like Indivisible, Black Lives Matter, SURJ, Democratic Clubs, Solidarity Sundays, LGBTQ orgs, etc to partner with you! Start or Join a Demonstration. Click Here!